PART NUMBER TABLE-Search and validate part numbers by using the Search window to filter table output-Click on column headers to sort table. Use the Color Table to select the color code. Color choice will determine assembly Height per Part Number Table. Use the Config Table to select assembly length and width dimensions: L-xxxx-0603-003, L-xxxx-0805-003, L-xxxx-x1206-002, L-xxxx-x1206-003, L-xxxx-x320-001, L-xxxx-x670-001, L-xxxx-x460-001, L-xxxx-x955-001 (CYLINDRICAL). Example: L-65330-A0603-003 is an NVIS Green A SMD LED with the following dimensions, Dimension A Length = .095 [2.4 mm] x Dimension B Width = 0.070[1.8 mm] x Height = 0.060[1.5 mm]. Green LEDs filtered for NVIS Green A have u’ and v’ chromaticity values that are near the upper left limit of the color radius per MIL-STD-3009. 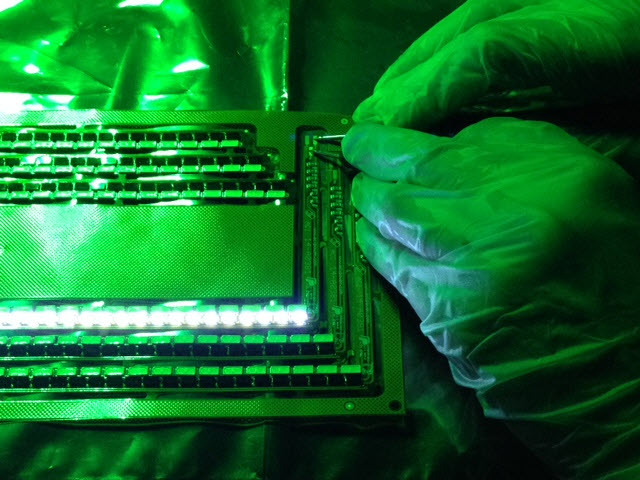 Due to variations in the LED manufacturing process and drive currents, the green color may shift slightly beyond the NVIS Green A color limit. This will have no effect on compliance to Class A NVIS Radiance. NVIS PolyVision Optical Filters are subject to the following thermal constraints: Intermittent Use Temperature 190°C. Extended Use Temperature 120°C. Stray unfiltered light emitting from the bottom of the LED can cause IR leakage. Potting may be required to light-seal the assembly. IR Opaque Light baffles are now available to facilitate this process. Use the SEARCH Window in the Part Number Table to search, filter, and validate part numbers. Table can be sorted by any column header to narrow your search by NVIS Color, LED color, Dimensions, etc.